Thu., Dec. 6: Alabama nose guard Quinnen Williams was named the recipient of the 73rd Outland Trophy on Thursday night during The Home Depot College Football Awards from the College Football Hall of Fame in Atlanta. The 2018 Outland Trophy, presented by the National Foundation for Infectious Diseases (NFID), is awarded annually to the nation’s best college interior lineman on offense or defense. 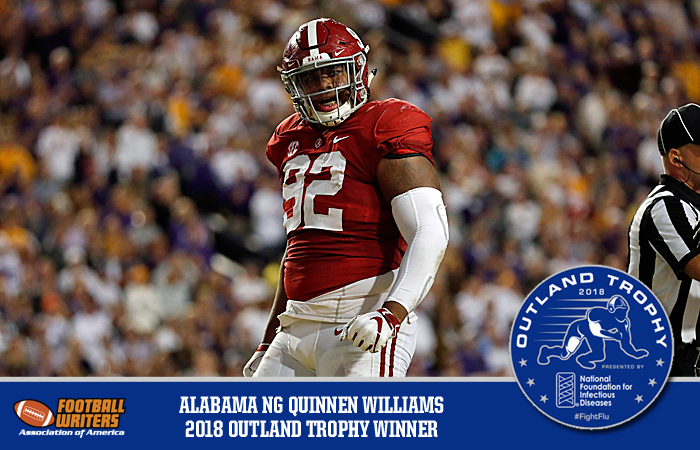 Quinnen Williams is the first of Alabama’s now five Outland Trophy winners to play on defense.